We are leading company who manufacturing and exporting premium quality coconut oil expeller both at home and aboard. We have rich experience in manufacturing and supplying large selection of various oil processing equipment for various vegetable crops. This series integrated coconut oil expeller mostly composed by four parts: feeder, press chamber, electrial control and vacuum filter drum. The heating system is inside press cage. The filtering drum is vacuum with sight glass. The oil sight glass can help user to control the speed of oil clearing process. This model of coconut oil expeller is a type of the most advanced oil processing machines, characterized by their convenient operation and high productivity. 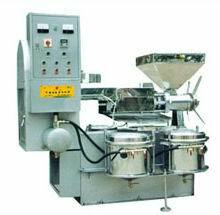 It is quite suitable for small and medium sized oil extruding workshops or professional farmers. Aslo, they can be used for prepressing in submerging oil workshops.This integrated oil expeller has multiple functions, including to screw oil press, electrical element for heating chamber, vacuum filter for clearing oil. Before pressing some parts of the press such as the press chamber, press screw and press ring will be preheated. During pressing, the coconut oil expeller can filte the oil in due time. Only one machine the user could get the better edible oil. We give the best service, we offer the most competitive price in coconut oil processing. Anytime you are going to buy machinery like coconut oil expeller, feel free to write to us in the following form.